The game of blackjack begins with between one and eight decks of card being shuffled by the dealer. Face cards are valued at 10, aces are worth one or 11 (up to the player and can change during the hand), and all other cards are worth their face value. Each player is then allowed to place an initial wager. After bets have been made, the dealer deals two cards face up to each player (starting on his left). 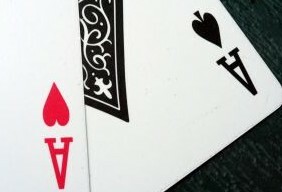 The dealer receives only one face up card, although in games outside of Europe and Australia the dealer will also receive a face down card (known as the ‘hole card’). Our goal is to accumulate cards as close to 21 as possible, while still exceeding the total of the dealer’s hand. If the player’s total exceeds 21, then he/she busts (loses the hand and bet). Hit – Adding another card to their hand. You can hit as many times as you wish, but once you go over 21, you lose. Stand – Choosing not to take any additional cards and remain on the total of whatever your cards show. Split – If the first two cards have the same value, the player can choose to split them. These cards form two separate hands and receive another card each. An additional bet must be made to accompany the second hand and then both are played out as normal. Double Down – The player may choose to double their original wager and in return, they receive only one additional card. If your cards total 10 or 11, this is often a popular bet because you have a good chance of hitting a card valued at 10 to take you to either 20 or 21. Surrender – The player has the option of surrendering their hand instead of playing it out. The penalty for surrender is the loss of half of the player’s initial wager. Insurance – If the dealer’s card is an ace, the player may choose to purchase insurance against a potential dealer blackjack. The size of the wager can be up to half of the player’s original bet. If the dealer does hit blackjack, this bet pays at 2:1. If not, the player loses any chips wagered as insurance.